Structure Improved Design-- Sturdy D shape body and screw gate lock hooks spring Link improved the structure to make it stronger and lighter. Multifunctional-- Can be connect to belt loops, handbag, backpacks, keychains, etc. You can also use them to put up tent light. Light But Strong-- Made of durable lightweight aluminum alloy, ultra light but strong. WARNING-- Can only be used for hanging light weight stuff. 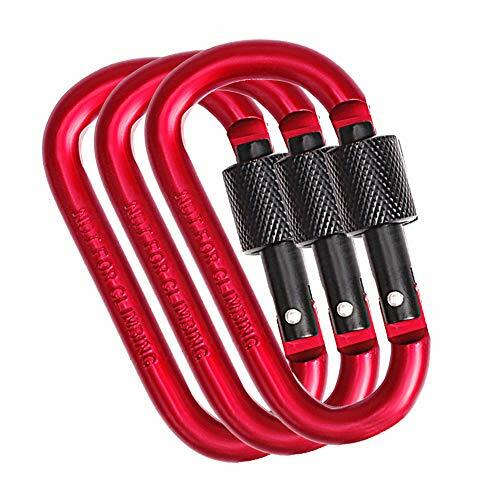 NOT applicable for climbing, swing, hammock, punching bag, big dog leash or heavy duty safety equipment, etc. Easy To Use-- It works smoothly as the spring-loaded gate makes it easy to connect items to a pack or belt. So many uses for these clips!